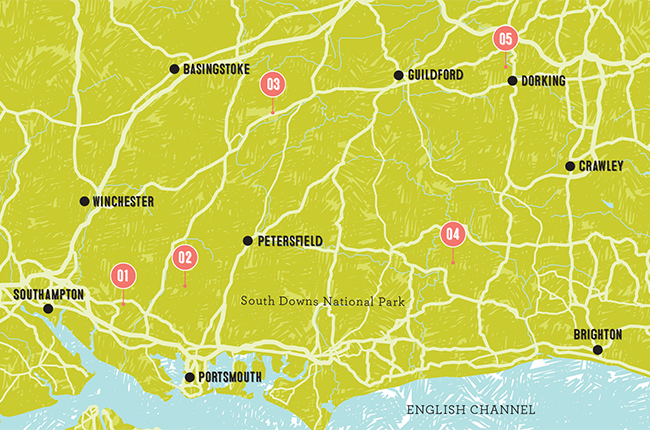 See five English wineries to visit, in and around the South Downs - just a short trip from London - from Lonely Planet's new wine travel book Wine Trails. As the twisted vines testify, this vineyard in Wickham, on the southwest tip of the South Downs National Park, is one of the oldest in England. But English vine-growing goes much further back; at the time of the Norman Conquest in the 11th century grapes were being made into wine. Currently, Three Choirs is better known for its restaurant, serving locally sourced produce. www.three-choirs-vineyards.co.uk/hampshire; tel +44 (0)1329 834700; Botley Rd, Shedfield, Southampton; 2.30pm Wed-Sun cheese & wine tour (fee applies). Credit: Lonely Planet Wine Trails. It’s been 10 years since Chardonnay vines were planted at Hambledon. ‘The chalk on which we grow our vines was formed on the seabed of the Paris basin some 65 million years ago,’ says managing director Ian Kellett. ‘The same chalk is found in the best Chardonnay areas of the Côtes des Blancs in Champagne.’ With winemakers Hérve Jestin of Champagne Duval Leroy, and Antoine Arnault, a graduate of Reims University, on board, Hambledon’s French connection is strong. A short drive north of Three Choirs, Hambledon Vineyard is set in the idyllic Hampshire village of the same name, a place of hills, fields, woods and little-used flint-strewn lanes. ‘We were at an event at Nyetimber in 2004,’ recalls Simon Bladon, ‘and the wine was very good. I asked them where it was from and they said “here”. So I came back and planted a field of vines, as you do.’ Jenkyn Place is on the northern edge of the chalk band, with the Downs about half an hour’s drive south. This is a very pretty corner of Hampshire, close to Chawton where author Jane Austen lived. Jenkyn Place is open to the public for only a few days in July each year, as part of the Hampshire Fare food festival – but summer’s the best time to visit anyway. Cross the border into West Sussex to visit Nutbourne Vineyard. Nearby Nyetimber may have been in the vanguard of the English sparkling wine revolution – but it’s not open to the public. However, Nutbourne in Pulborough is open to all, and in 2015 its still white wine won a gold medal at the International Wine and Spirit Competition, the first English still wine to win. The sparkling wines are also sensational. The family-owned winery is based in a 19th-century windmill midway along the Downs. The Jazz in the Vines concerts take place in August. From Pulborough, turn towards the North Downs for Denbies in Dorking, one of England’s largest vineyards. It specialises in sparkling white wines; with the Demi-Sec displaying classic Champagne scents of brioche and pear.